There was once a prince, and he wanted a princess, but then she must be a real Princess. He traveled right around the world to find one, but there was always something wrong. There were plenty of princesses, but whether they were real princesses he had great difficulty in discovering; there was always something which was not quite right about them. So at last he had come home again, and he was very sad because he wanted a real princess so badly. In the middle of the storm somebody knocked at the town gate, and the old King himself sent to open it. It was a princess who stood outside, but she was in a terrible state from the rain and the storm. The water streamed out of her hair and her clothes; it ran in at the top of her shoes and out at the heel, but she said that she was a real princess. ‘Well we shall soon see if that is true,’ thought the old Queen, but she said nothing. She went into the bedroom, took all the bed-clothes off and laid a pea on the bedstead: then she took twenty mattresses and piled them on top of the pea, and then twenty feather beds on top of the mattresses. This was where the princess was to sleep that night. In the morning they asked her how she slept. 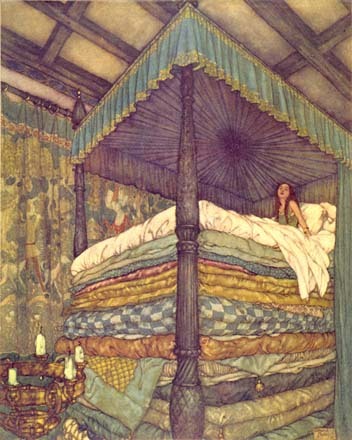 They saw at once that she must be a real princess when she had felt the pea through twenty mattresses and twenty feather beds. Nobody but a real princess could have such a delicate skin. So the prince took her to be his wife, for now he was sure that he had found a real princess, and the pea was put into the Museum, where it may still be seen if no one has stolen it. Now this is a true story.